Earlier this week, we posted about a deal on the original Huawei Watch in its black stainless steel finish. But if you have to have the latest, most stylish tech on you, the Watch 2 Classic is just $319.99, with its more affordable Sport sibling only $239.99, on Amazon. That's $50 off the Classic, making it the lowest price we've seen on Amazon for it, and $60 off the Sport. The Watch 2 Classic is essentially a re-bodied Watch 2 Sport. It sports (ha, get it?) a 1.2" 390p AMOLED display, a Snapdragon Wear 2100, 768MB of RAM, 4GB of storage, a 420mAh battery, and IP68 water resistance, as well as GPS, NFC, and an ambient light sensor. 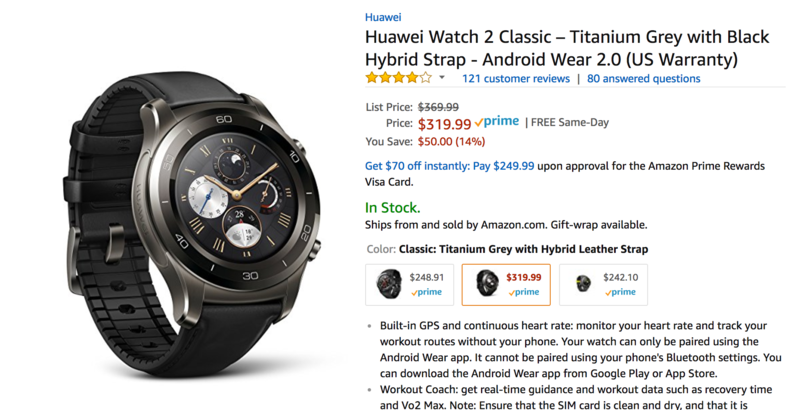 You can actually get a new Watch 2 Sport in the speckled Concrete Gray for $242.10 on Amazon right now, but it's being sold by a third-party seller, and there are only a few left in stock. The Carbon Black-colored Sport is actually less expensive at $239.99, and the Titanium Grey Classic is only $319.99 - both roughly $50 off of their MSRPs. And for those of you who think the Classic is expensive, take a look at the Porsche Design model. The Classic will look like a downright bargain.